Note: this post is written from the perspective of a non-book reader. I haven’t read the books and don’t have any plans to. But it doesn’t surprise me; I’ve found the Lord of Dragonstone undeniably magnetic from the beginning. It’s one of those fondnesses I find difficult to pinpoint, but here’s a start: In a world full of over-the-top, self-important drama queens — Cersei in her flowing brocade gowns, Tyrion with his boozing and his zingers, Dany with her dragons and her proclamations — Stannis is hilariously, lovably square. Stannis, with his dour gray attire and somber smirk, has the look and disposition of, like, a middle-manager at an office supply company, or a chartered accountant. Everything about him is out of place amid the pomp and pageantry of Westeros. While I’m told the character is wittier and more sarcastic in the books, on the show, I kind of love how dry and prickly he is. It’s a breath of fresh air. The contrast of his unflappable sternness with the bizarro gang around him makes his whole story line more interesting. Stannis has a pretty ragtag band over there on Dragonstone — a well-read daughter with grayscale, an insane fundamentalist wife, a wise smuggler, and a red witch prone to birthing out murderous shadow-babies branded with his face (to be fair, he doesn't have a great PR team). It could be a weird buddy comedy if there wasn’t so much fratricide and fundamentalism baked into the whole thing. Tucked away on Dragonstone, Stannis and his gang have been a bit isolated from the action thus far — but the interior dynamic, with the poor guy pulled between Davos and Melisandre — not to mention pulled between Melisandre and his wife — is a thrilling little character drama itself. The whole creepy atmosphere of the place, along with actor Stephen Dillane's' nuanced characterization, leaves viewers guessing what’s going on in Stannis' head, and what his ultimate motivations are. That’s why it was so thrilling when he surprised everyone at the Wall. What is the guy's deal, you know?! Of course, Stannis is also an underdog — both in terms of getting bumped unfairly out of the line of succession when it was his turn, and also in a narrative sense. He rarely gets the screen time or the scenery-chewing monologues of his fellow Iron Throne claimants. He’s just, well, competent, with what appears to be the most legitimate claim to the throne (not to get into it, but plenty of book readers have), a decent head for military strategy (he has a giant map!) and the ability to act rationally when needed (minus the Melisandre stuff, but nobody’s perfect). Frankly, it’s refreshing to have someone in Westeros who actually seems like they are good at their job — who actually pays attention to the White Walker threat, for example, instead of quibbling among themselves over power and revenge. While other characters indulge their selfish whims or their shifting allegiances or are consumed by greed or vengeance, Stannis’ values are refreshingly old-fashioned: He wants to rule, and rule justly -- even though no one will give him a chance. "And that's the quiet tragedy of Stannis Baratheon. Nobody picked him, nobody loves him. He could literally save the world, and it still wouldn't gain him the throne, in the end. But the thing that makes him a true king is that he's going to do it anyway." 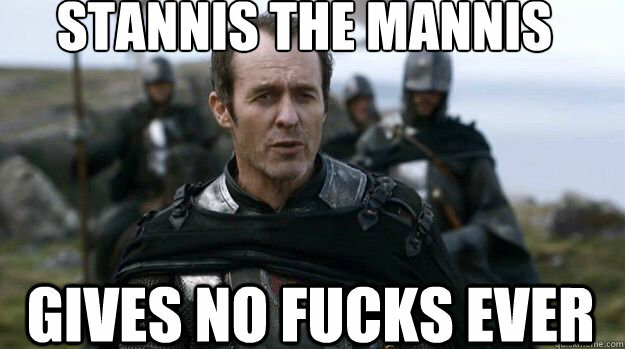 Much of Stannis' appeal lies in the skill of British actor Stephen Dillane. Like "Game of Thrones" costars Iain Glen (Jorah Mormont), Charles Dance (Tywin, RIP) and Ciaran Hinds (Mance Rayder, RIP), Dillane brings a certain amount of gravitas and British acting heft to the role, which some of the show’s many newbies don’t have — Dillane has an impressive résumé; he has starred in acclaimed films like "Welcome to Sarajevo," "Fugitive Pieces" and "The Hours," won a Tony for "The Real Thing," a BAFTA for "The Shooting of Thomas Hurndall" and an Emmy nomination for playing Thomas Jefferson in the "John Adams" miniseries. Dillane skillfully handles the character's nuances, of which there are many -- yet another reason the character appeals. He's broody and devious (murdering his brother) and yet also strangely kind and noble (like in his loyalty to Davos, or when he prevents his wife from slapping his daughter). Between and including never and often. So what does he like about the show? “I think it’s an accurate and truthful reflection of how power operates, in different societies, and the relatively small part love and affection play in things." As I discovered when I plunged down the Stannis the Mannis rabbit hole, many fans feel that Benioff and Weiss gave short shrift to the character on the show and have underplayed his sense of humor and deadpan delivery, as well as the sense of duty and strong leadership he embodies. Here are some book readers in their own words, responding to variations of the oft-asked question, “Why does anyone like Stannis?" I don't know what's next for Stannis, but judging by what book fans are saying, things are about to heat up for our man at the Wall. Perhaps Stannis will redeem himself in this story line with Jon Snow, and will finally find the love among TV fans that he found during the book. Maybe viewers will realize the legitimacy of his claim and bend the knee in fealty to the one true King of the Andals and the First Men, Lord of the Seven Kingdoms and Protector of the Realm, etc., etc. Maybe I just have bad taste. (Like I said: Pete Campbell!) 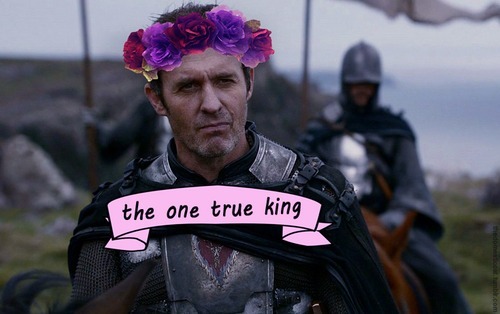 Or maybe he’s about to prove himself, and you’ll all join me in being Stannis stans too. Winter is coming, after all.